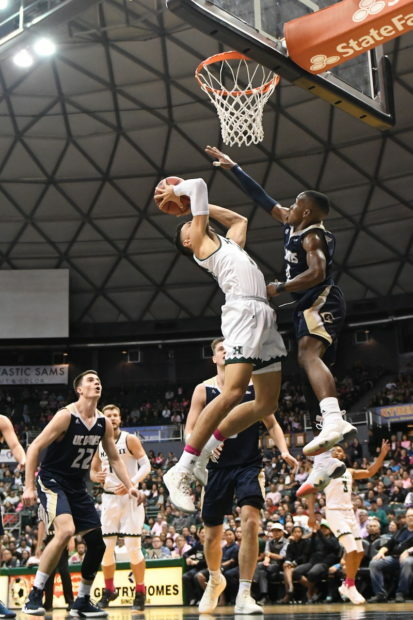 If there is such a thing as taking advantage of what the schedule gives you, Saturday’s game could be it for the University of Hawai’I basketball team. 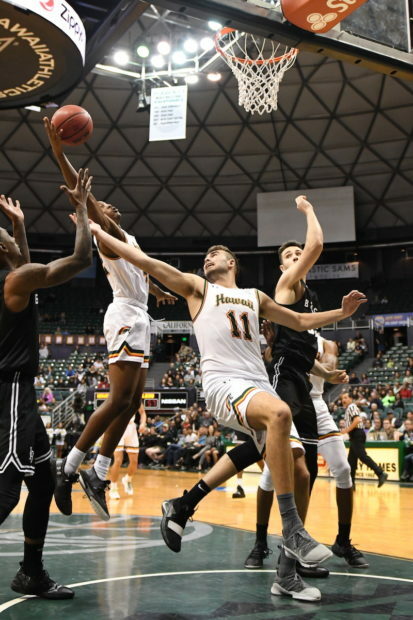 The Rainbow Warriors will conclude a four-game homestand by hosting UC Santa Barbara in a battle to reach second place in the Big West Conference. The game is scheduled to start at 8:00 p.m. as part of a basketball doubleheader at the Stan Sheriff Center. The UH women’s basketball team will play Cal Poly in the first game at 5:30 p.m. Fans with tickets to the men’s game can arrive early and watch both games. Federal employees who were furloughed during the recent U.S. Government shutdown can get free tickets to the doubleheader, while supplies last. Hawai’i is 13-7 overall; UCSB is 15-5. Both teams are 4-2 in the Big West, and currently tied for third place. The winner of Saturday’s game will move into a tie for second place; the loser will drop to fourth. The Warriors opened this homestand with a heartbreaking 75-74 overtime loss to first-place UC Irvine on January 23. They bounced back with two convincing victories – 80-60 over UC Davis on January 26, then 74-57 over Long Beach State on Thursday. In essence, the Warriors are a confident and comfortable team right now. Still, the Gauchos boast a talented lineup, boosted this season by the play of three Division I transfers – Ar’Mond Davis (Alabama), JaQuori McLaughlin (Oregon State) and Devearl Ramsey (Nevada). Davis, a 6-foot-6 senior, leads the team in scoring (14.3) and 3-pointers (36), and is also grabbing 5.8 rebounds per game. McLaughlin, a 6-4 sophomore, is averaging 11.3 points, 3.1 assists and 3.0 rebounds per game and has 32 3-pointers. Ramsey, a 6-foot sophomore, is contributing 11.8 points, 3.5 assists and 3.1 rebounds per game, and has 27 3-pointers. Another UCSB newcomer is 6-9 freshman forward Amadou Sow. He is averaging 10.5 points and 6.3 rebounds per game, and has a .566 field goal percentage. There is also the presence of Max Heidegger, a 6-3 junior guard. He was a first-team All-Big West Conference selection last season, and led the conference with 95 3-pointers. He sat out most of the games earlier this season due to concussion and leg injuries, and has not yet found the form he had last season. Heidegger has played in just nine games so far, and is averaging 7.3 points per game. He is shooting 24.3 percent from the field, and is a head-scratching 8 for 50 (.160 percentage) from 3-point range. The Warriors are in the thick of the Big West race due mainly to teamwork on both ends of the court. 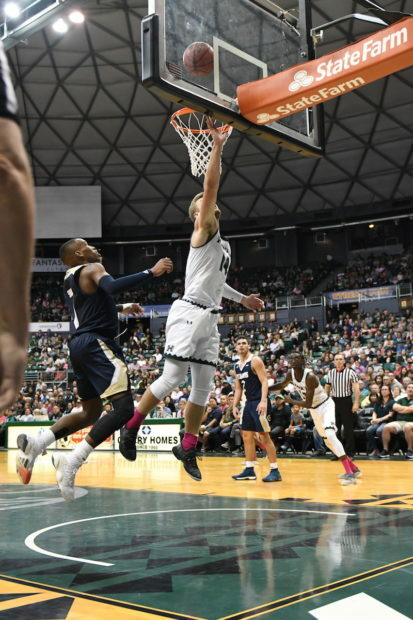 In the first three games of this homestand, Hawai’i’s opponents are averaging 64.0 points per game with percentages of .432 for overall field goals, .333 for 3-point field goals, and, oddly enough, .538 from the free-throw line. Junior guard Eddie Stansberry leads the Warriors in scoring at 12.7 points per game, and ranks second in the Big West for 3-pointers with 59. Senior forward Jack Purchase is averaging 11.7 points and 6.3 rebounds per game, and ranks fifth in the Big West for 3-pointers with 48. Junior forward Zigmars Raimo is averaging 11.6 points and 6.7 rebounds per game, and leads the Big West in field goal percentage at .584. Senior guard Brocke Stepteau scored 16 off the bench in Thursday’s win over Long Beach State, and he is averaging 9.3 points and 3.0 assists per game. Sophomore point guard Drew Buggs has been a catalyst during this home stretch, and he is averaging a Big West best 5.5 assists per game to go along with 8.9 points and 4.3 rebounds per game. Since joining the Big West in the 2012-13 season, Hawai’i has a 7-6 record against UCSB, including 4-2 at the Sheriff Center. When: Saturday, Feb. 2, 8:00 p.m.
Television: Live on Spectrum Sports – Channels 12 (SD) and 1012(HD). Streaming Video: BigWest.TV (Must be a Spectrum cable subscriber to stream in Hawai’i). Radio: Live on ESPN 1420 AM. Neighbor islands can listen live on KNUI on Maui, KPUA on the Big Island, KTOH on Kaua’i, and KNWJ in Pago Pago, American Samoa. Audio Webcast: ESPN1420am.com/Sideline Hawai’i App. Ticket Information: Lower Level – $30 for all seats. Upper Level – $18 or $20 for adults, $16 or $18 for senior citizens (ages 65 and older), $5 or $7 for students (ages 4 through high school). Upper level prices vary by section. UH Manoa students free with validated ID. Parking is $6. American Savings Bank is the sponsor of Saturday’s Chinese New Year Celebration game. Doubleheader Saturday – UH women’s basketball vs. Cal Poly starts at 5:30 p.m. Fans with tickets to the men’s game can arrive early and stay for both games. Federal employees who were furloughed during the recent U.S. Government shutdown can get free tickets to the doubleheader, while supplies last. Fans can register to participate in the American Savings Bank Tic-Tac-Toe halftime contest at Gate A for the chance to win a $100 Amazon Gift Card. Fans are encouraged to wear red, symbolizing the color of joy, blessing of happiness, and good fortune in celebration of the Chinese New Year. A special Chinese New Year’s themed food menu will be featured by Sodexo.